Our engines are made to run on up to 20% biofuel blends, reducing even more their environmental impact. The anti bumping frame surrounding the radiators prevents damage if the machine hits an obstacle at speeds up to 5 km/h, reducing unforeseen maintenance costs due to cracks in the radiators. We don’t like to waste time and fuel, and we know you don’t either, so we reduced significantly transport height with the overlapping cylinder geometry. The 580ST measures less than 3.5 m in height, while the 590ST and the 695ST measure less than 3.7 m.
The load sensing hydraulics provide just the right amount of oil for each task, even when the engine is running at low rpm. This results in fuel savings of up to 14% compared to traditional gear pumps. CASE is the only Backhoe loader manufacturer offering closed hydraulic centre whatever the choice of pump. Closed hydraulics enable simultaneous movements independent from work load and functions delivering constant power, better operator controllability and fast cycles. CASE has enriched the offering introducing a new backhoe design with “In-Line” cylinder geometry and inner extendahoe. The new solution allows the customer to choose the better technology for his own needs. A different solution to lead the market with top performances, comparable with well known CASE DNA characteristcs. The aligned cylinders ensure perfect visibility across the boom and reduce the structure bending distributing the stresses. This is the typical solution adopted on large excavators where productivity and reliability are a must. The new technology will flank the well known and more backhoe oriented CASE DNA boom with overlapping cylinders and outer extendahoe. 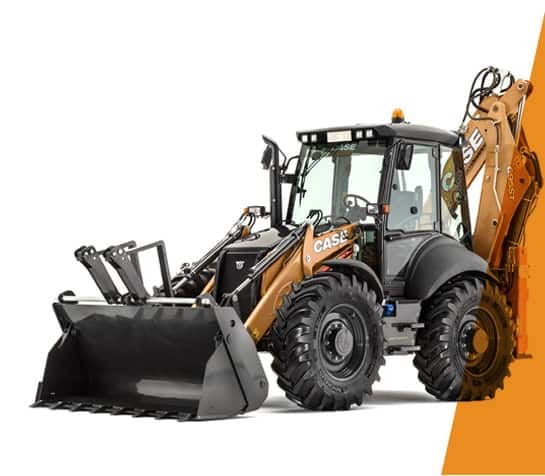 Auto Ride Control reduces loader arm bounce during travel, maintaining maximum material retention on all surfaces, for higher travel speeds and reduced journey times. The system offers a choice of 3 settings to match customer preferences or different soil conditions. Curved front loader arms improve truck loading while mechanical self-levelling assists the operator. Return-to-dig function signifi cantly reduces the operator effort on repetitive loading operations and speeds up the whole cycle. Excellent front loader visibility and the mechanical self-levelling feature make loading and unloading pallets really quick and simple. For the professionals requiring very high tipping height or for those working mainly with the backhoe the Straight Loader Arm is the preferred solution. The arm design makes the loader structure less complex minimizing the greasing points and providing higher visibility on the front of the machine. The straight and long arms have the loader pin point 8 cm higher than standard bent arms without affecting the breakout and loading performance which are aligned with the more “traditional” solution. The anti-tipping function keeps the bucket on the correct position while lifting the load, consequently there is no risk of material spillage.